Chinese motorsport is set to be propelled onto the world stage as Porsche Motorsport Asia Pacific announced the country’s entry into the inaugural FIA GT Nations Cup during a press conference on Friday. The high-profile FIA GT Nations Cup is one of the few global events to give country representatives the chance to challenge their counterparts from around the world, as they face-off at the Bahrain International Circuit on 30 November – 1 December. China will participate in the competition with the powerful Porsche 911 GT3 R, run by the Herberth Motorsport team, as they compete against international teams from 18 countries and regions, including Malaysia, Japan, Hong Kong and Thailand, as one of two Porsche entries. Representing Team China is experienced Porsche driver Li Chao, a strong competitor in both the Porsche Carrera Cup Asia’s Pro-Am class and China GT Championship, as well as rising young talent Leo Ye, who has earned accolades in the Asian Le Mans Series and Japanese Formula 3 Championship. Chao, who also runs in China GT, played a crucial role in applying for his nation’s entry into the competition. Team China will compete with support from Porsche Motorsport Asia Pacific, while three-time Porsche Carrera Cup Asia Champion Chris van der Drift will be on site to provide advice and coaching for the two drivers. 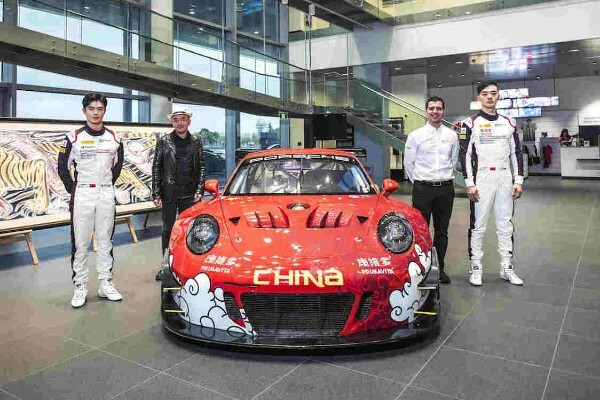 Building further excitement for this landmark milestone in Chinese motorsport will be a special livery for the Porsche 911 GT3 R created by young Chinese artist Wu Junyong. Depicting a fierce battle between two of the country’s icons – a dragon and a tiger – Wu’s artwork was selected as part of a nationwide programme that saw dozens of young artists submit entries. His original creation, which was first painted on a four-metre traditional Chinese scroll, was then transferred onto the car by internationally renowned French designer Stéphane Brun, whose motorsport artwork has appeared in global competitions around the world, including the 24 hours of Le Mans, Porsche Carrera Cup Asia and for Jackie Chan DC Racing.